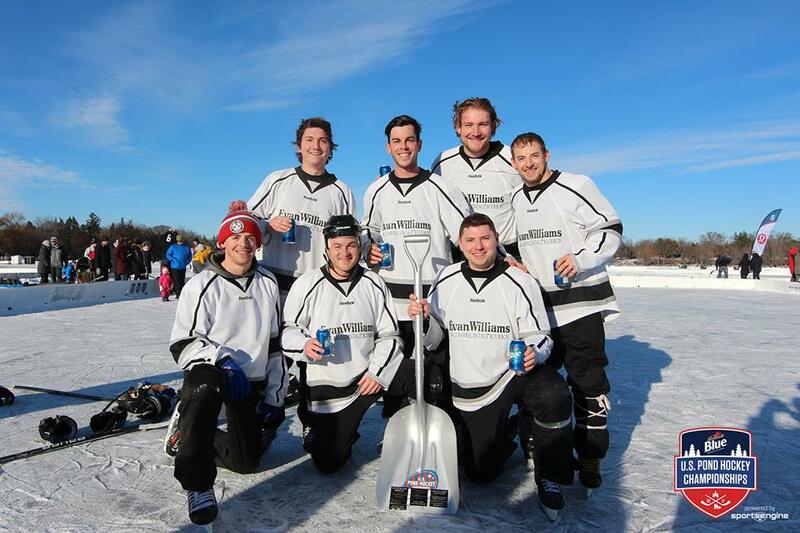 Evan Williams Single Barrel won the U.S. Pond Hockey Championships' Cedar Division title in 2017. It only figures that one of the most legendary feats in the history of pond hockey was forged in Kentucky. Derek Steinbrecher, his younger brother Deron and their good buddy Aaron Leichty are Kentucky natives who live in Louisville. They’ll tell you that the hockey is better in the Bluegrass State than you might imagine, and it only takes a few minutes watching them in action to nod your head in agreement. Not only do the Kentucky boys pass the eye test, they win games, too. Lots of games. Last year their Evan Williams Single Barrel squad, bolstered by a handful of Minnesotans, won a mind-boggling 15 U.S. Pond Hockey Championships games at the in three days. That’s 15 wins and no losses. That’s the stuff of legend. “None of us would have ever guessed we would have gone on that kind of run,” said Derek Steinbrecher, the team’s captain. Steinbrecher said he was seven years old when he became fascinated with hockey after watching the Mark Messier-led New York Rangers beat the Vancouver Canucks in the 1994 Stanley Cup Finals. Right then, he decided he wanted to play hockey. “So I did,” he said. Not counting their amazing run to the Cedar Division championship last year, the competitive careers for Derek Steinbrecher and Leichty topped out at the club hockey level while playing for the University of Kentucky. Deron Steinbrecher played club hockey at the University of Louisville. “Not the pedigree that a lot of other teams have up here,” Derek said. Deron said postgame conversations with opponents are especially fun when the inevitable, “Where did you play in college?” question comes up. “You squeak out a win against a bunch of guys who played Division I and then you tell them you played D3 (club hockey) at the University of Louisville,” Deron said. Now in his seventh year at the event, Derek said there have been some growing pains. There have been jersey and team name changes, lineup adjustments and years of understanding the nuances of what it takes to consistently win pond hockey games against high-level competition. The team played in the Open Division with mixed success, going 3-1 in pool play one year and going 0-4 in another. Last year Evan Williams won its four Cedar Division pool play games by a combined score of 63-6. The team also participated in the Sundown Showdown on Friday night (a tournament within the tournament) and won the event with six consecutive victories. Five more wins on championship Sunday, including an 8-6 triumph over Concrete Mitts in the championship, were enough to secure the title. Leichty, the team’s “stay-back guy” who ensures no easy goals are allowed, said in two of the Sunday victories Evan Williams Single Barrel was required rally from 5-3 halftime deficits to earn 8-5 victories. This year Evan Williams Single Barrel moved back up into the Open Division. The team lost 6-5 in overtime to 2013 Open Division champion WoodStars to open Friday’s play, then rebounded with a 7-4 triumph over MN Inboard. With only one player who stands taller than six-feet, Evan Williams Single Barrel relies predominately on speed and puck movement to break down opponents. Al and Randy Johnson of Burnsville, Ryan Witty of New Prague, Mike Vath of Rosemount and Will Farisey of St. Paul Johnson are the Minnesotans on the roster. As for moving up a division, Derek Steinbrecher said he knew what the team was facing when it returned to the Open. “The guys are bigger, there are a lot of very experienced hockey players that played at high levels,” he said. “You see us line up against other teams … we played a couple of teams last year that you would never have picked us to win the game. And a lot of victories, more than any team has amassed in a single weekend. “They definitely understand how to win a pond hockey game,” Reichert said.